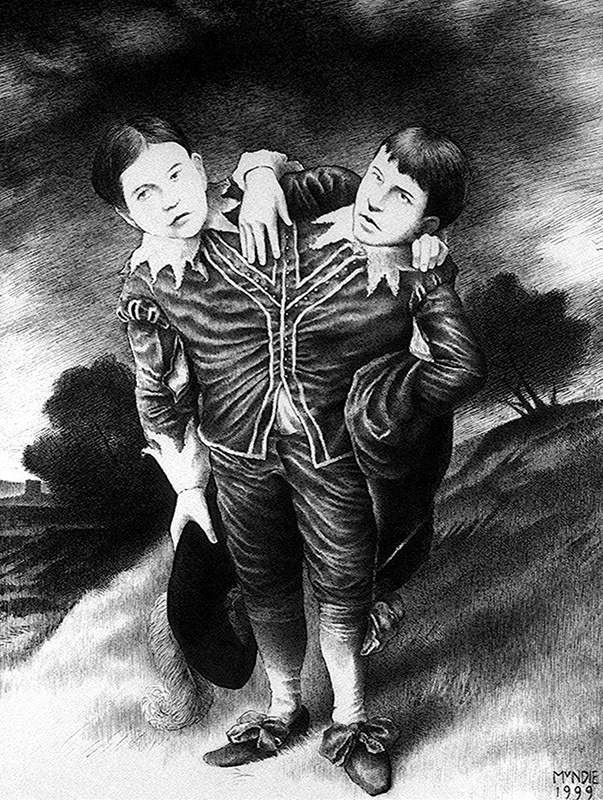 Giacomo and Giovanni Baptista Tocci, known as the Italian Two-headed Boy, were a popular attraction throughout Europe and America from their infancy in 1878 until their retirement at the age of twenty in 1897. The dicephalus twins were born in Locana, Italy, on 4 October 1877. The boys being very small and their mother's pelvis rather wide, there was little difficulty — other than emotional shock — in their delivery. The boys had two heads and four perfectly formed arms, but were joined together below the point of the sixth rib and so shared a single lower torso and pelvis with two legs. Initially distraught and appalled by his children's appearance, Signor Tocci soon realized his unique boys could serve as his family's breadwinners. As the Tocci Brothers grew into healthy youngsters contrary to all predictions of an early death, it became apparent that each of the twins controlled the leg on his own side. Sadly, due to muscular atrophy and Giacomo's clubfoot, they were unable to stand independently unless they could prop themselves up with their arms. Lack of coordination prevented them from walking unaided; instead, they generally crawled about using all six limbs. The Tocci Brothers — "The Greatest Wonder of Nature" — toured Europe and America ceaselessly until they decided they had had quite enough of the limelight and retired to live a life of seclusion in a villa near Venice. Rumors state that both boys may have married and had children (which caused a flurry of sexual and legal speculation in French and Italian newspapers), and that they may have still been living in seclusion as late as 1940. Author Mark Twain used the Tocci Brothers as the inspiration for his story Those Extraordinary Twins. This drawing was inspired by Thomas Gainsborough's The Blue Boy of 1770. One of the Tocci Brothers' cabinet card photographs may	be seen here.